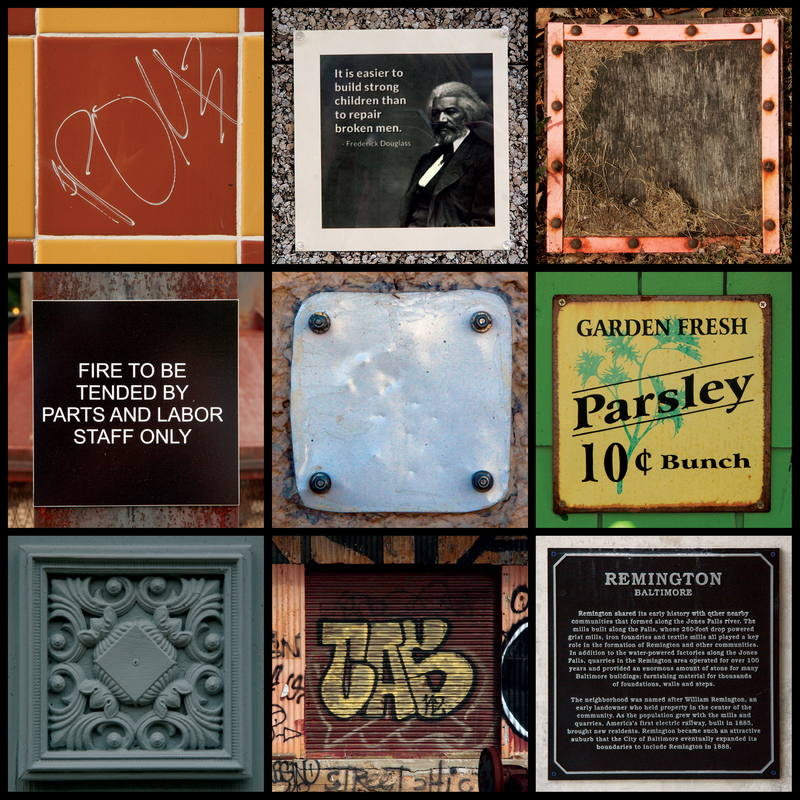 A 3 x 3 photomontage of nine square items found in the Mount Vernon neighborhood of Baltimore, MD. 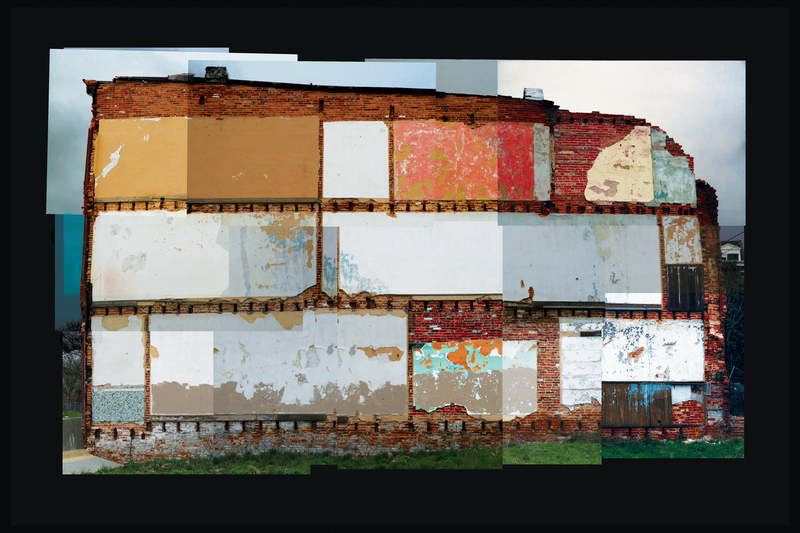 A photomontage of a row house wall in East Baltimore, MD. 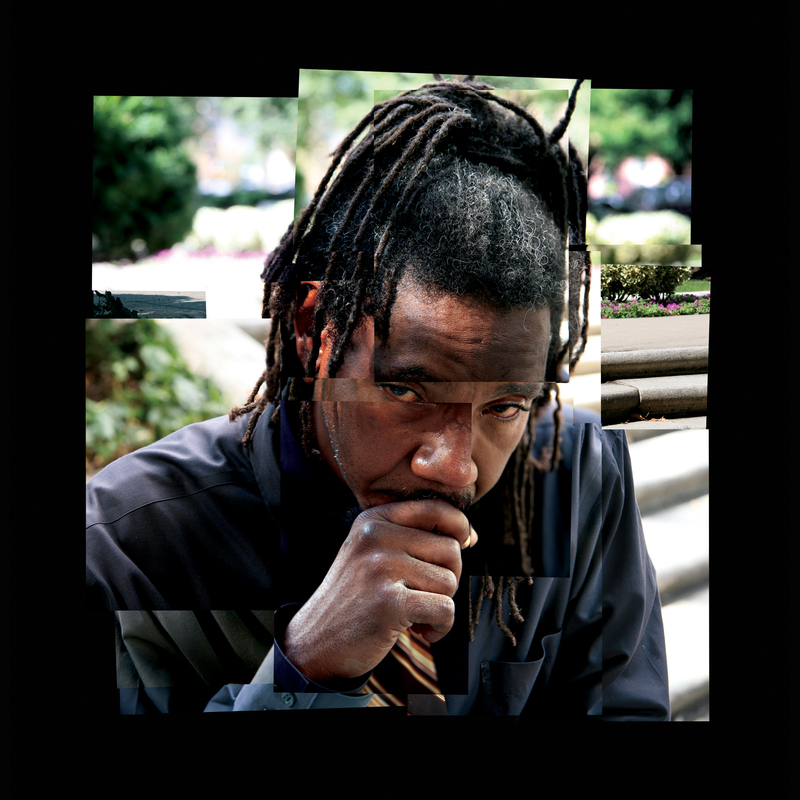 A photomontage of a homeless man I befriended in Mount Vernon Place, Baltimore, MD. A detail from The Square Route... (2001): Eight black-and-white medium format photographs arranged into a grid to be read from the top left and around in a clockwise rotation to form the sentence: "The square root of eighty one is nine." Dereck Stafford Mangus is an artist and writer based in Baltimore. 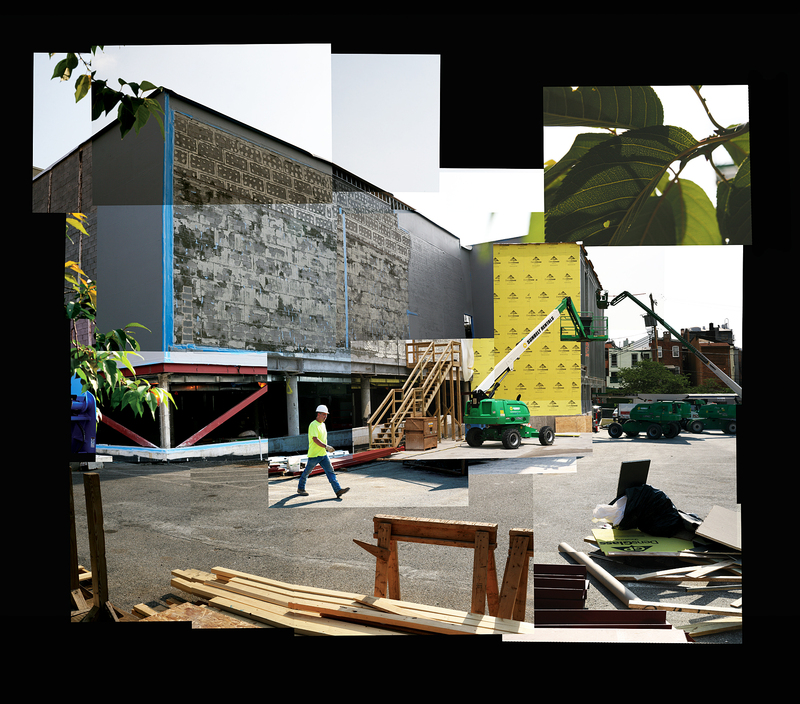 In 2016, Mangus completed the MA program in Critical Studies at the Maryland Institute College of Art. This past May, his essay, "Feel the Color: Mark Bradford," was published in Full Bleed, MICA's annual art and design journal. Most recently, Mangus' exhibition review, "Jack Whitten, 'Odyssey: Jack Whitten Sculpture, 1963-2017,'" was selected as the winner of the Frieze Writer's Prize 2018. 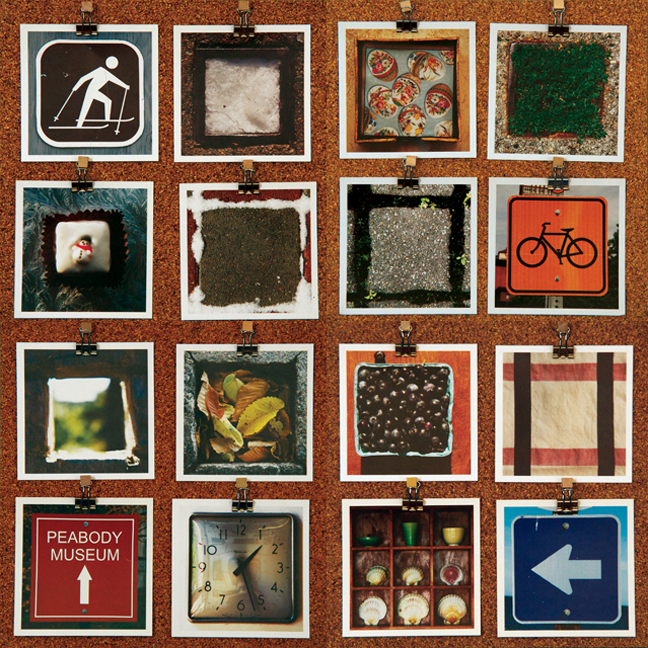 The Square Project began in 2001 as a postal art exchange between my older sister and myself while she was studying design in London and I was studying art at UMass Boston. I was enrolled in a photography course and trying to come up with a final project when, for whatever reason, we began playing around with the different meanings of the word "square" in our mailings. "Square" could be a formal design element or a slang affront: "You are such a square!" This got me thinking about how something so simple could work on so many levels. I was shooting with medium format film, which makes square negatives, so it just made sense to begin shooting square things I came across in the world. I’ve been doing so ever since. 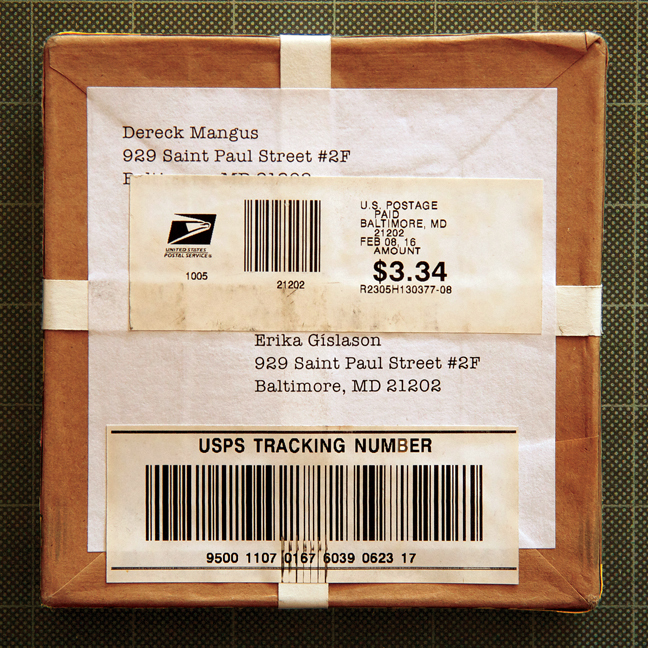 What began as a playful postal art correspondence evolved into a sustained photo series, and ultimately the subject of my graduate thesis, "The Persistence of and Resistance to Structure: The Grid-Square Construct in Western Visual Culture." Squares are everywhere in the built environment: buttons, drains, hatches, signs, windows, and vents for example. The square also represents time, with its four equal sides suggesting the four seasons, and in the form of the calendar, with its grid of squares demarcating days of the week. In 2016, I designed a calendar based on my square series and mailed them out to friends, family, colleagues, and artists whose work I admire. 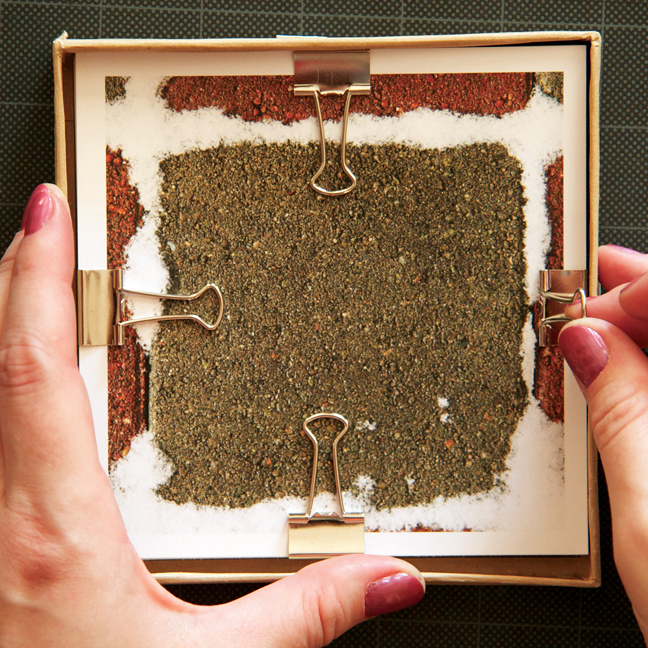 I included 16 square photographs (12 months + 4 seasons) and the necessary hardware for assembling a wall hanging. Eight black-and-white medium format photographs arranged into a grid to be read from the top left and around in a clockwise rotation to form the sentence: "The square root of eighty one is nine." One of eight black-and-white medium format photographs arranged into a grid to be read from the top left and around in a clockwise rotation to form the sentence: "The square root of eighty one is nine." A 3 x 3 grid of nine square items found in the Allston neighborhood of Boston, MA. 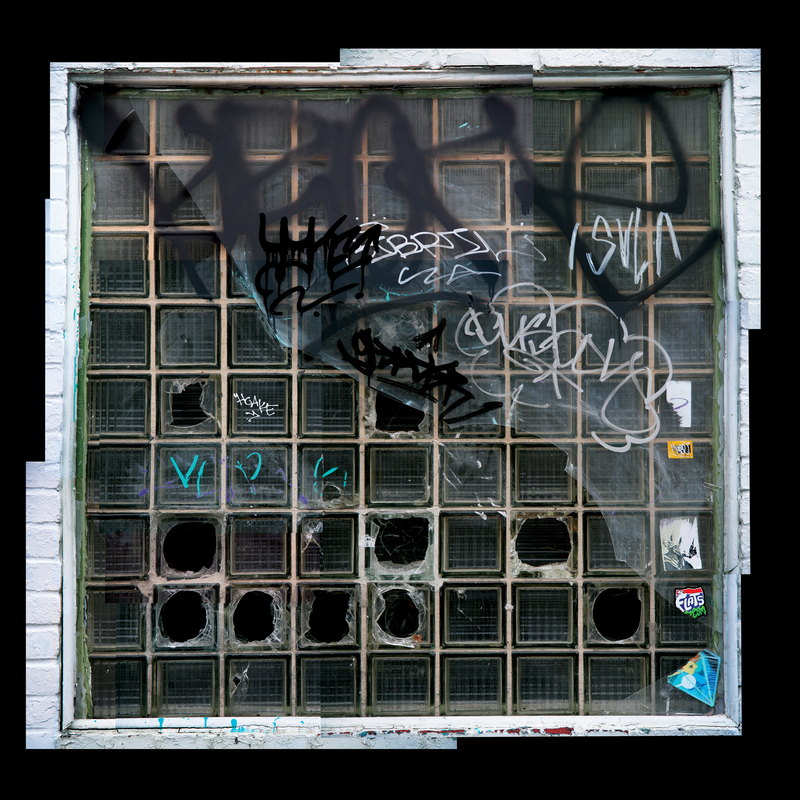 A 3 x 3 grid of nine square items found in the Lower Allston neighborhood of Boston, MA. A 3 x 3 grid of nine square items found in the Brighton neighborhood of Boston, MA. A 3 x 3 grid of nine square items found in the Back Bay neighborhood of Boston, MA. 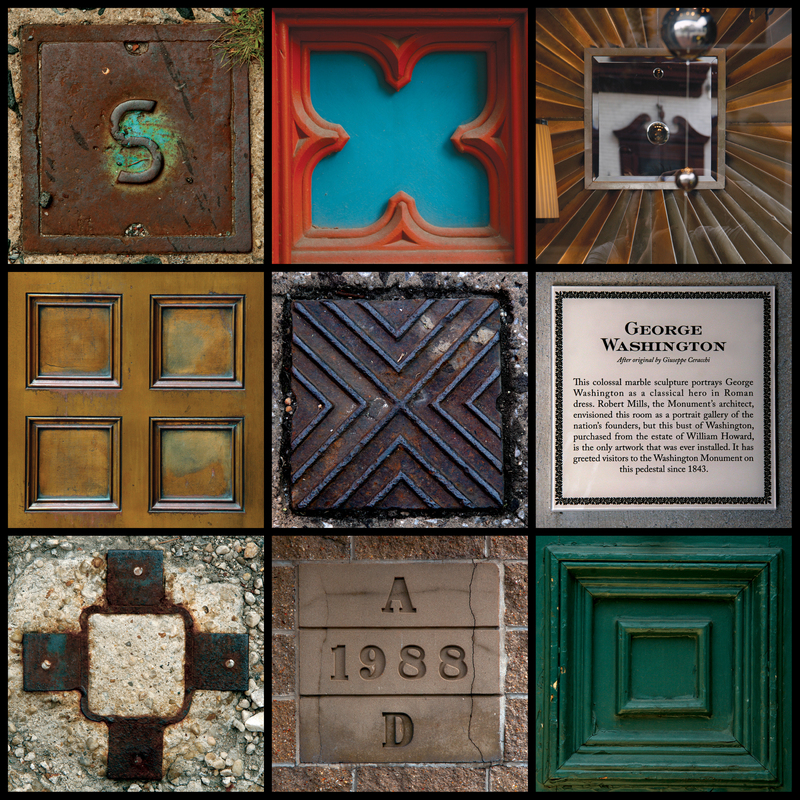 A 3 x 3 grid of nine square items found in the Charlestown neighborhood of Boston, MA. 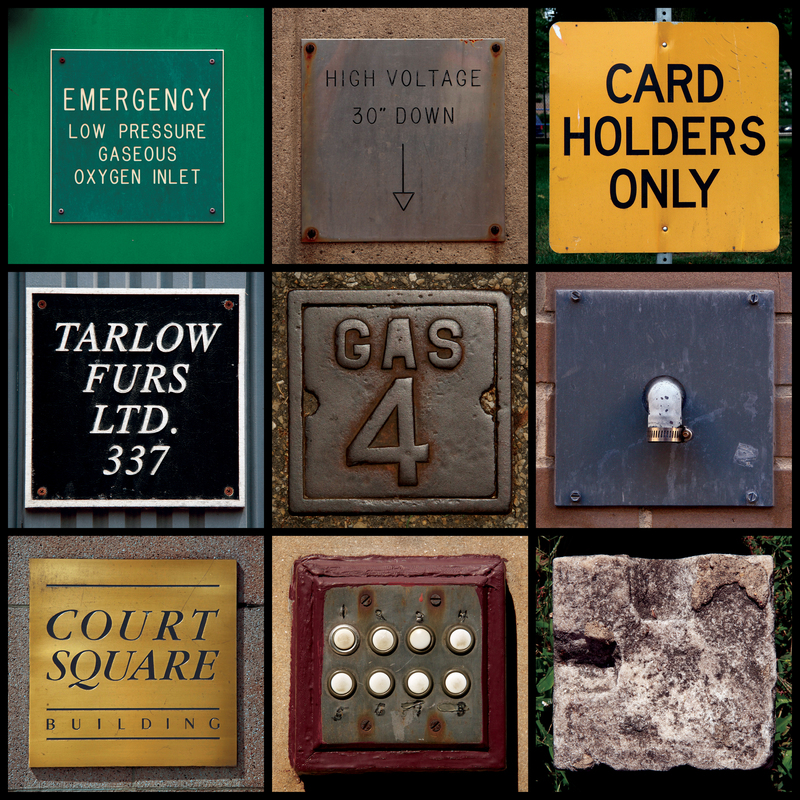 A 3 x 3 grid of nine square items found in the Jamaica Plain neighborhood of Boston, MA. 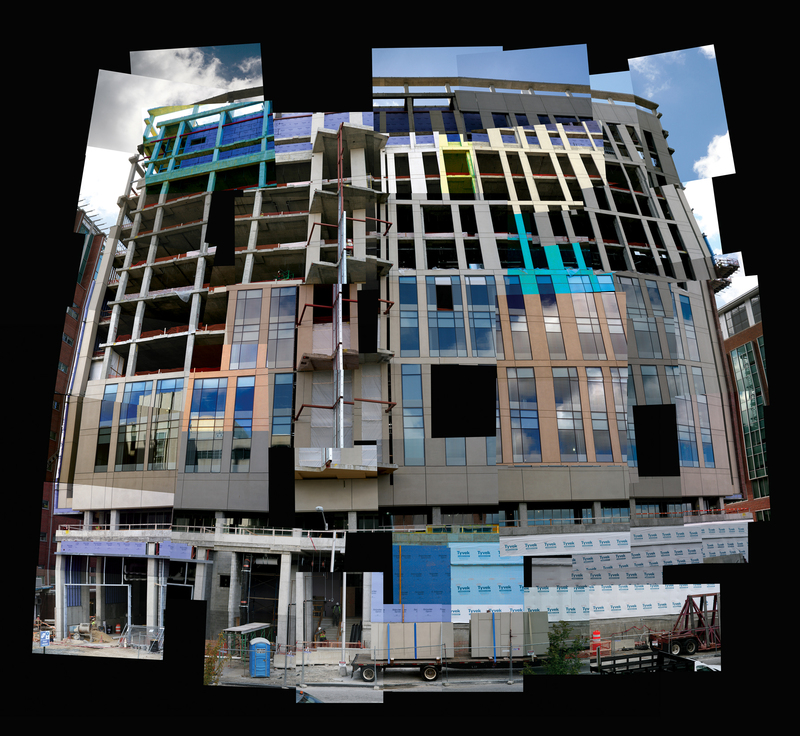 A 3 x 3 grid of nine square items found in the Longwood Medical Area of Boston, MA. 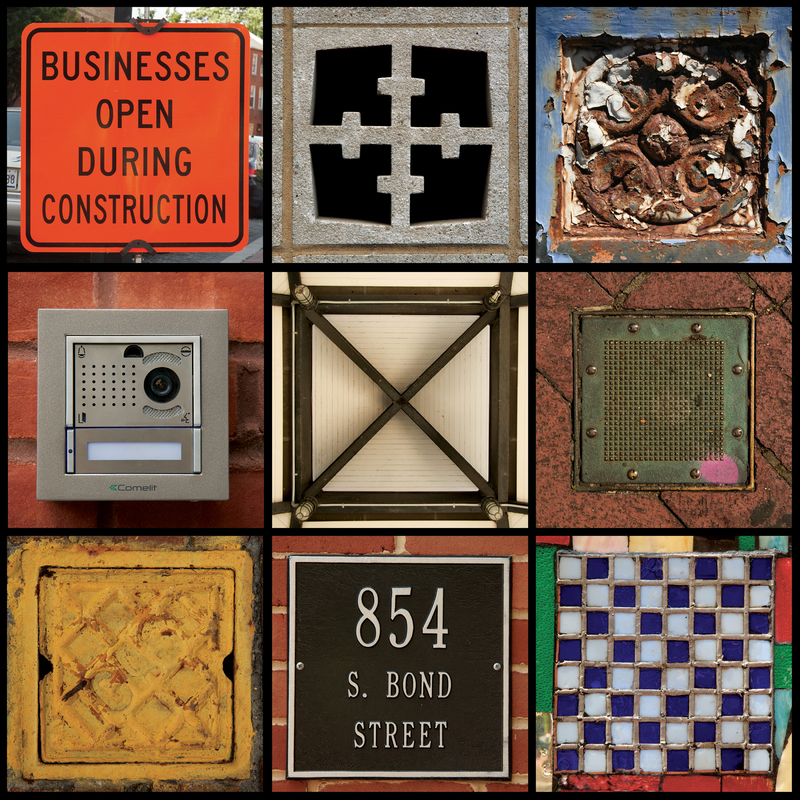 A 3 x 3 grid of nine square items found in the South Boston neighborhood of Boston, MA. 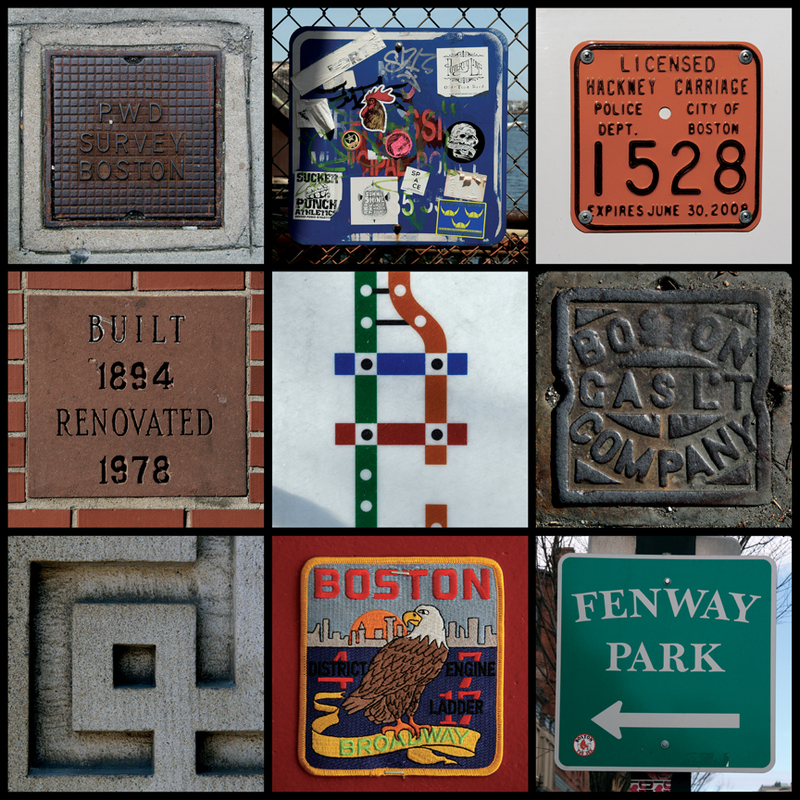 A 3 x 3 grid of nine square items found in Boston, MA. A 3 x 3 grid of nine square items found in Baltimore, MD. A 3 x 3 grid of nine square items found in the Bolton Hill neighborhood of Baltimore, MD. 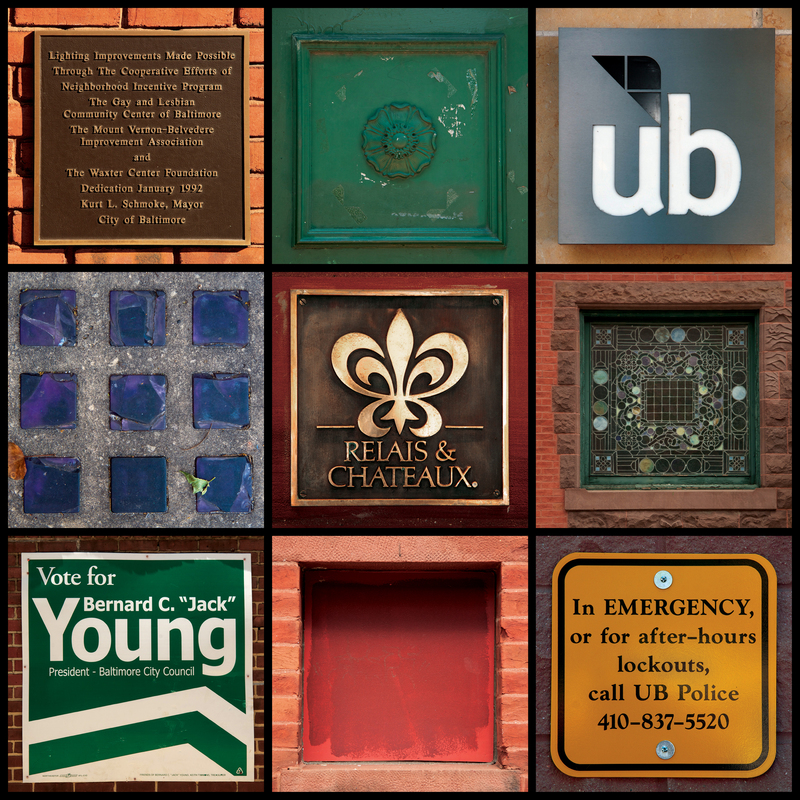 A 3 x 3 grid of nine square items found in the Downtown area of Baltimore, MD. A 3 x 3 grid of nine square items found in the Federal Hill neighborhood of Baltimore, MD. 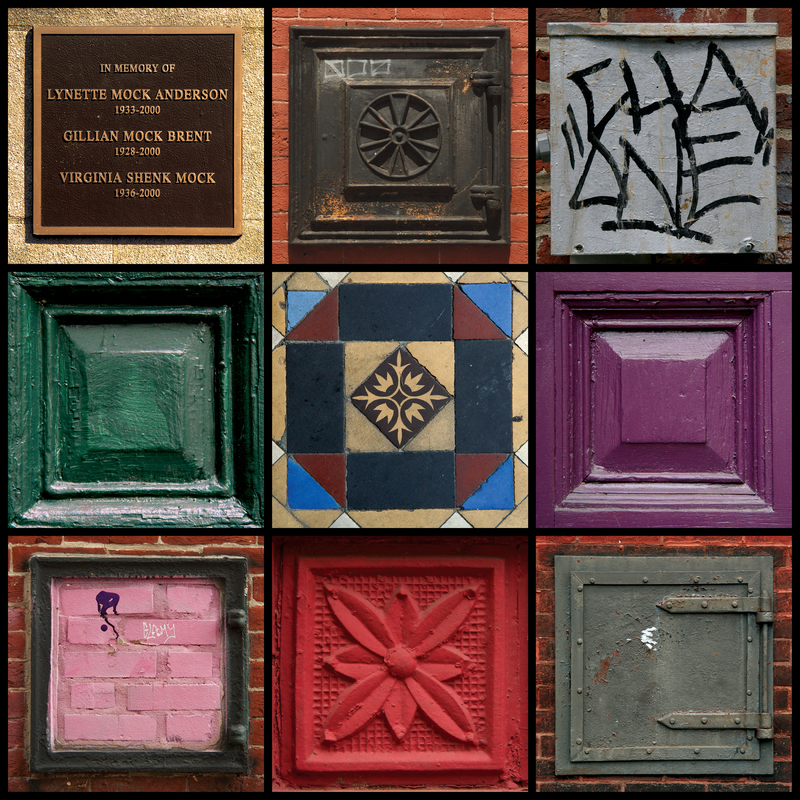 A 3 x 3 grid of nine square items found in the Fells Point neighborhood of Baltimore, MD. 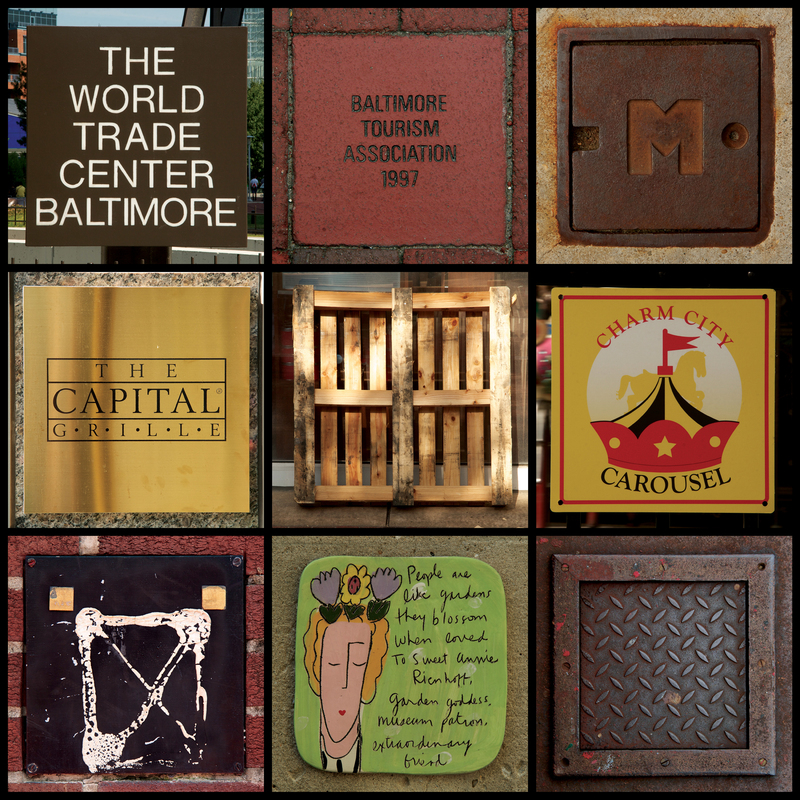 A 3 x 3 grid of nine square items found in the Inner Harbor area of Baltimore, MD. 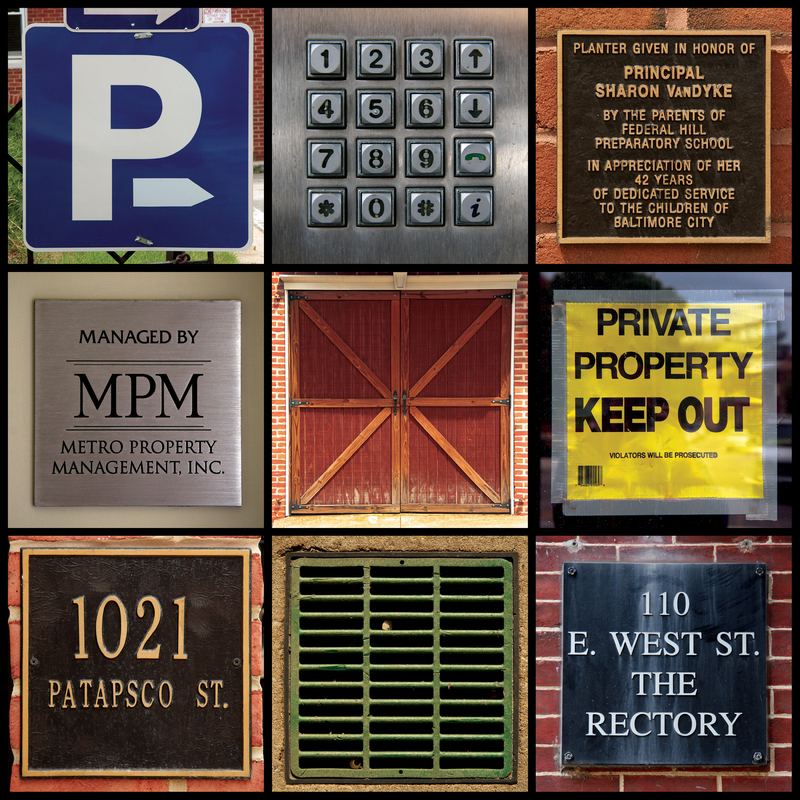 A 3 x 3 grid of nine square items found in the Mid-Town Belvedere neighborhood of Baltimore, MD. A 3 x 3 grid of nine square items found in the Remington neighborhood of Baltimore, MD. 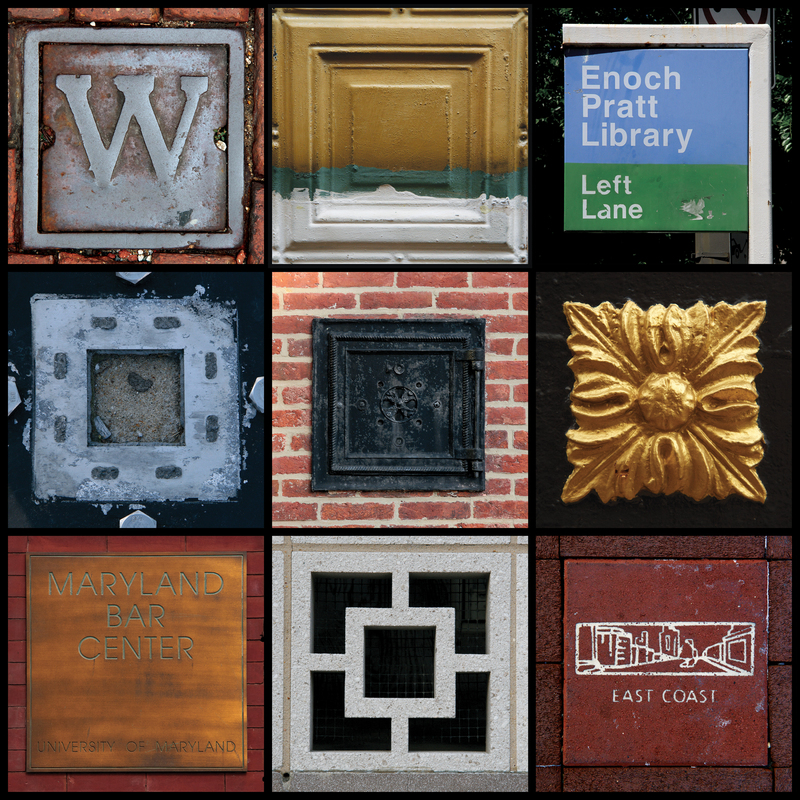 A 3 x 3 grid of nine square items found in the Charles Village neighborhood of Baltimore, MD. 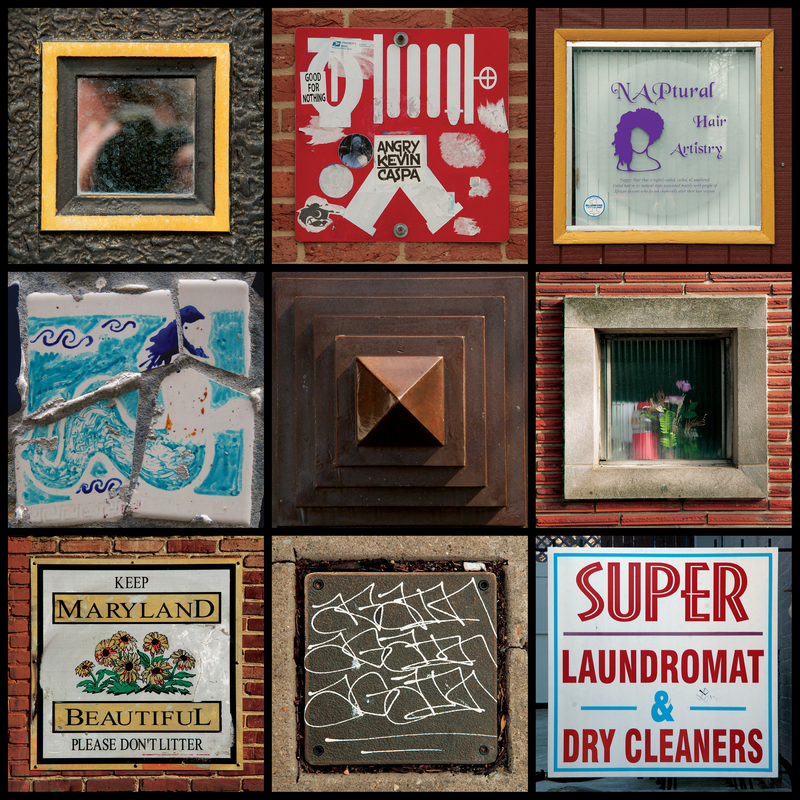 A photomontage of a square window found in the Charles Village neighborhood of Baltimore, MD. A 4 x 4 grid of 16 square photographs on cork board representing the year 2016. The squares at the outer edge represent the 12 months, while the central 4 signify the 4 seasons. 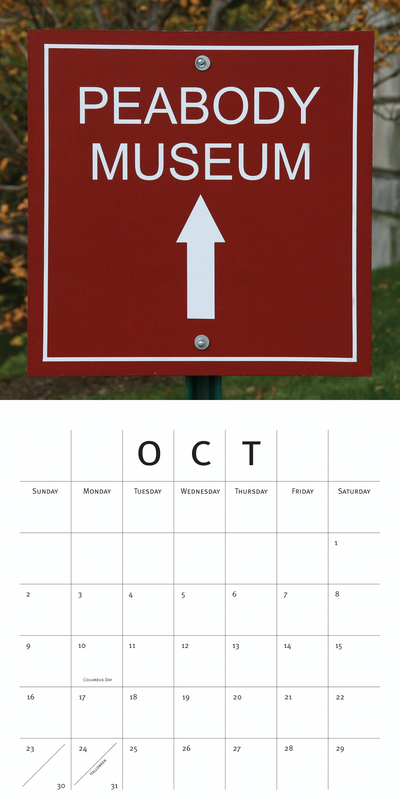 The calendric information is on the reverse side of each square. Photographic documentation of the square mailers containing my Calendar (2016), which I mailed out that year. A square photograph representing the season of Spring. 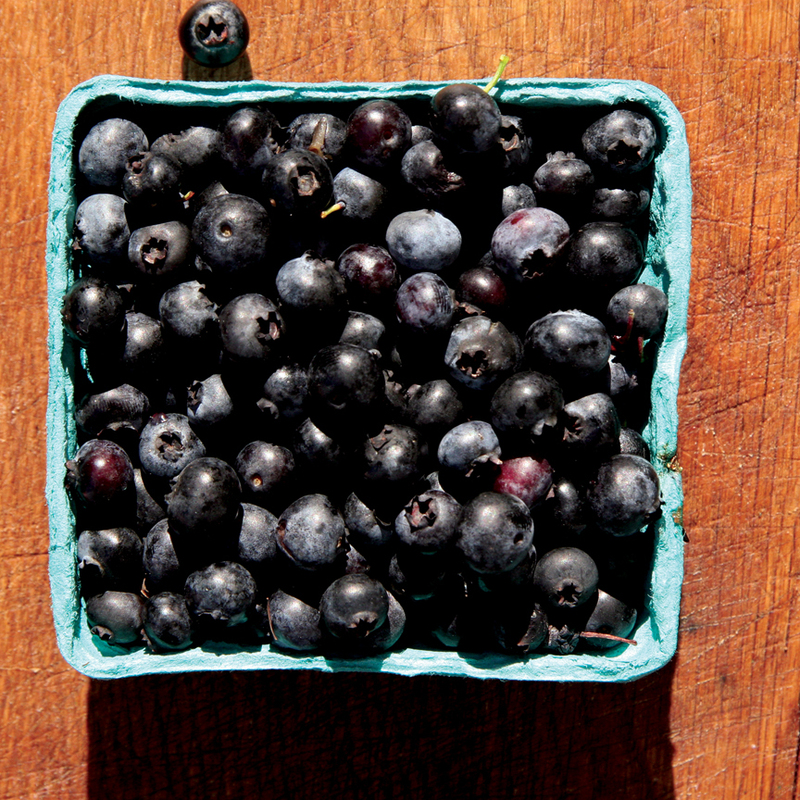 A square photograph representing the season of Summer. 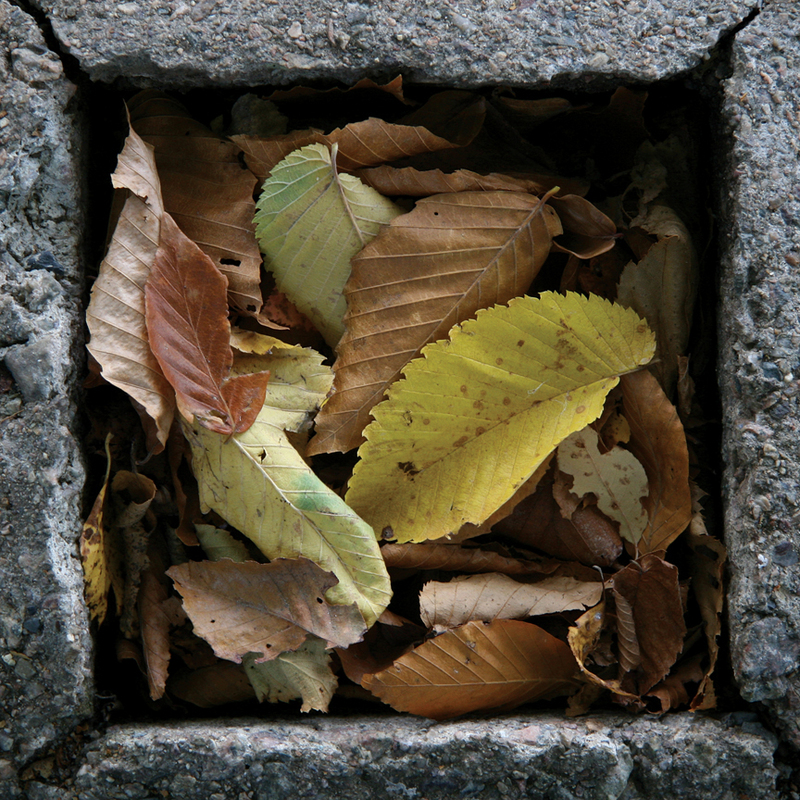 A square photograph representing the season of Fall. 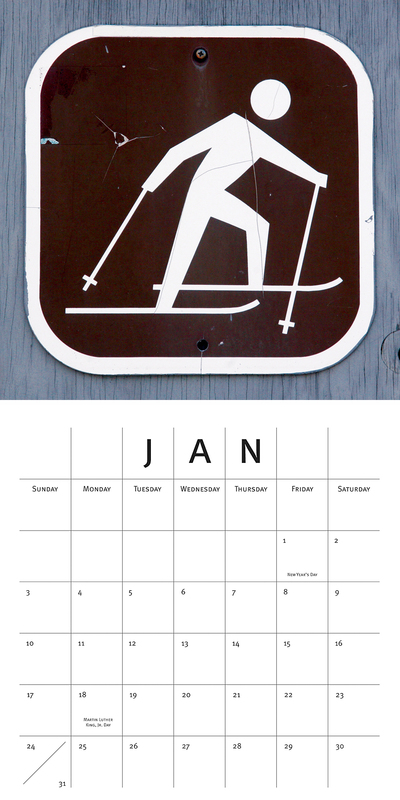 A square photograph representing the month of January. 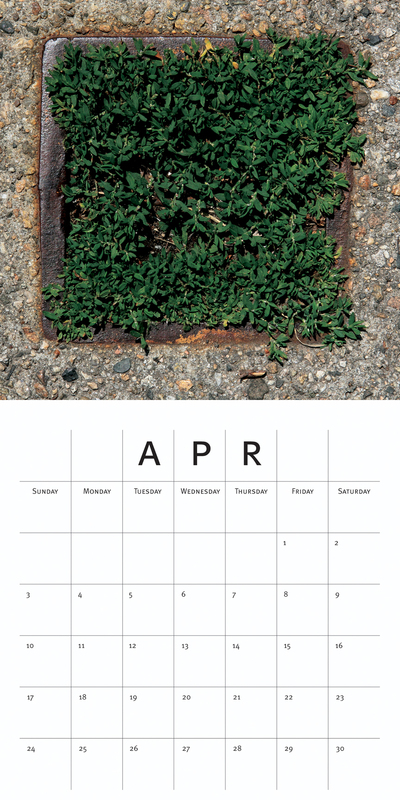 A square photograph representing the month of April. 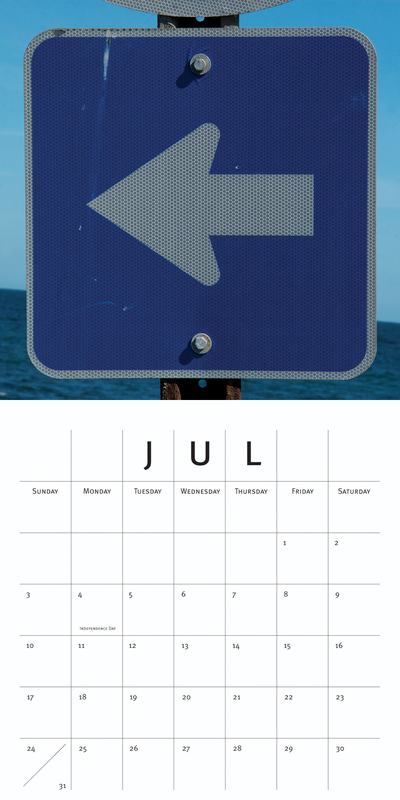 A square photograph representing the month of July. A square photograph representing the month of October. 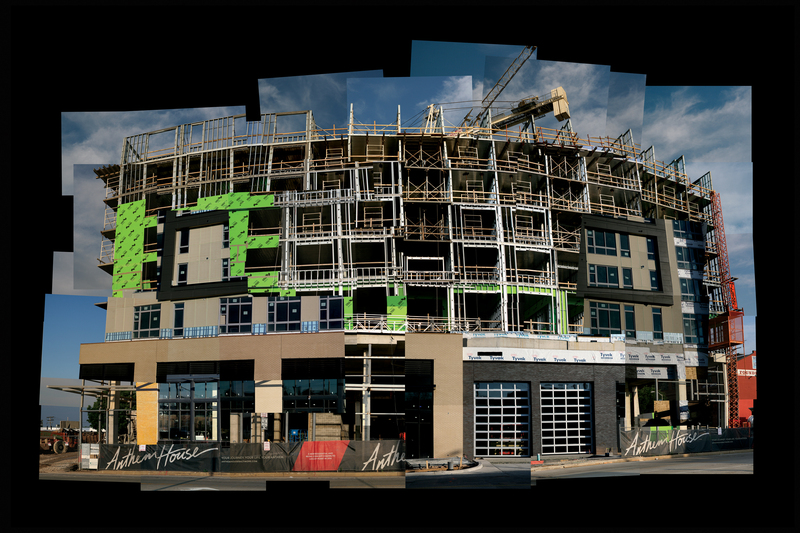 I am deeply inspired by the built environment in which I live and work. My Constructions illustrate this well. 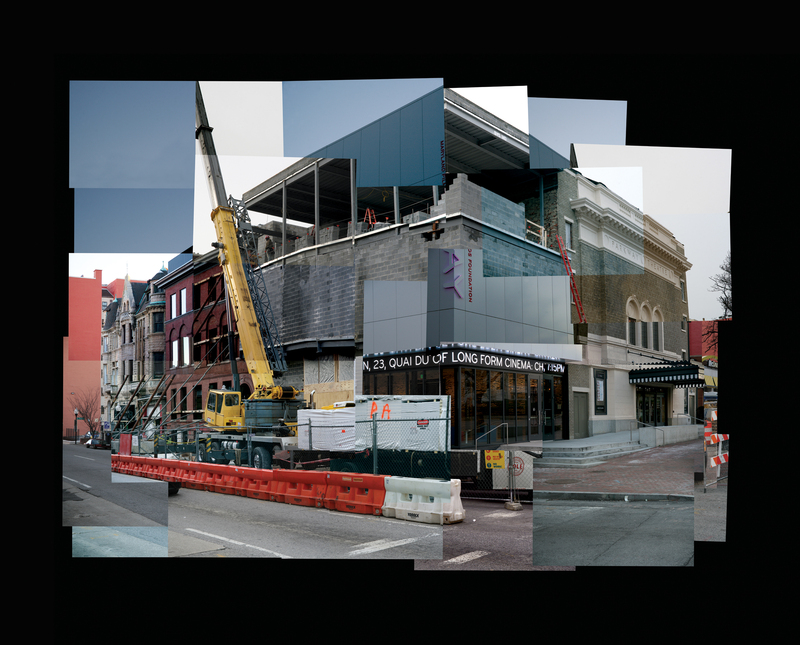 For this series of photomontages, I locate buildings under construction and take multiple shots across their façades, sometimes revisiting the site several times over the course of its development. 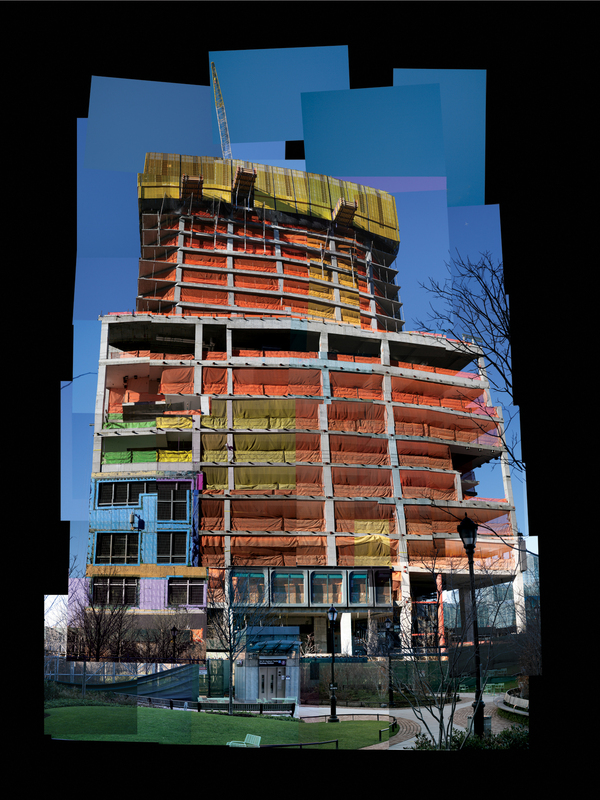 I later re-construct the multiple shots (and shoots) into one larger composite image. This format is familiar to many tourists and is reminiscent of the photographic work of David Hockney. 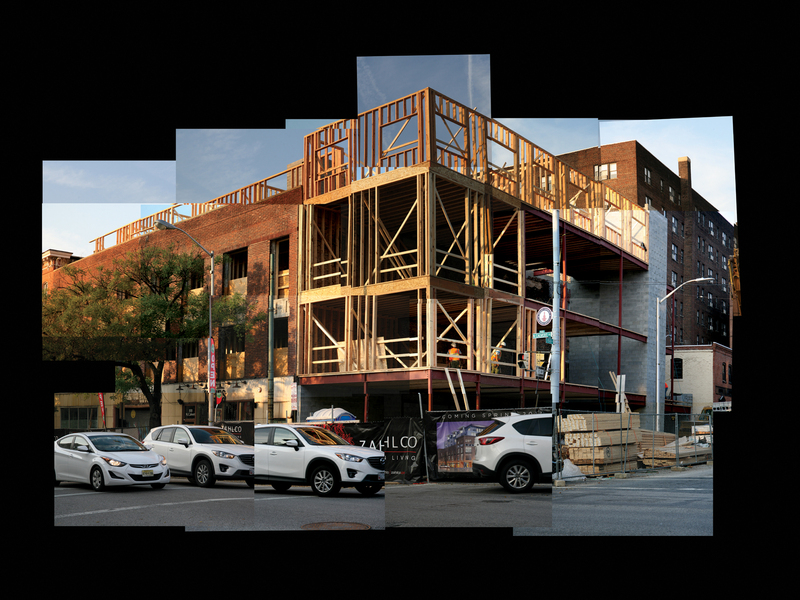 But by specifically focusing on construction and renovation sites, I create a space for communication between the three-dimensional materiality of architecture and its two-dimensional representation. The various materials of art and architecture recombine in this series to convey a sense of perpetual flux. 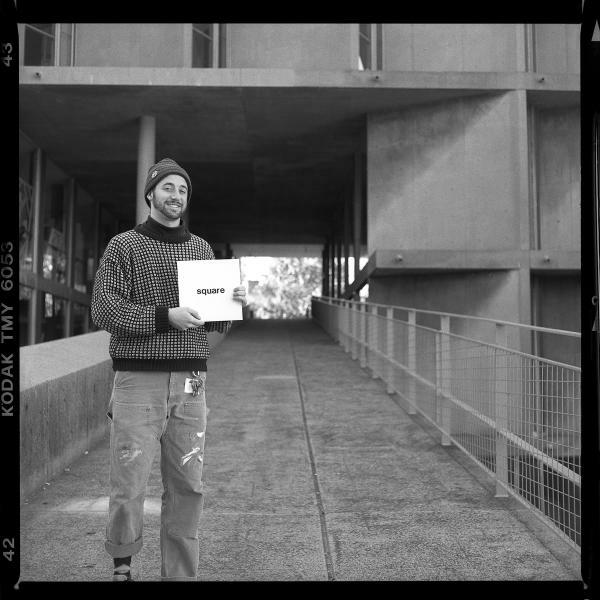 The analogy of work, as in how human beings work their environment through abstract strategies and concrete structures and how artists re-work that same environment through visual representation, connects the two activities of art and architecture. A landscape is something that is worked over by human processes. 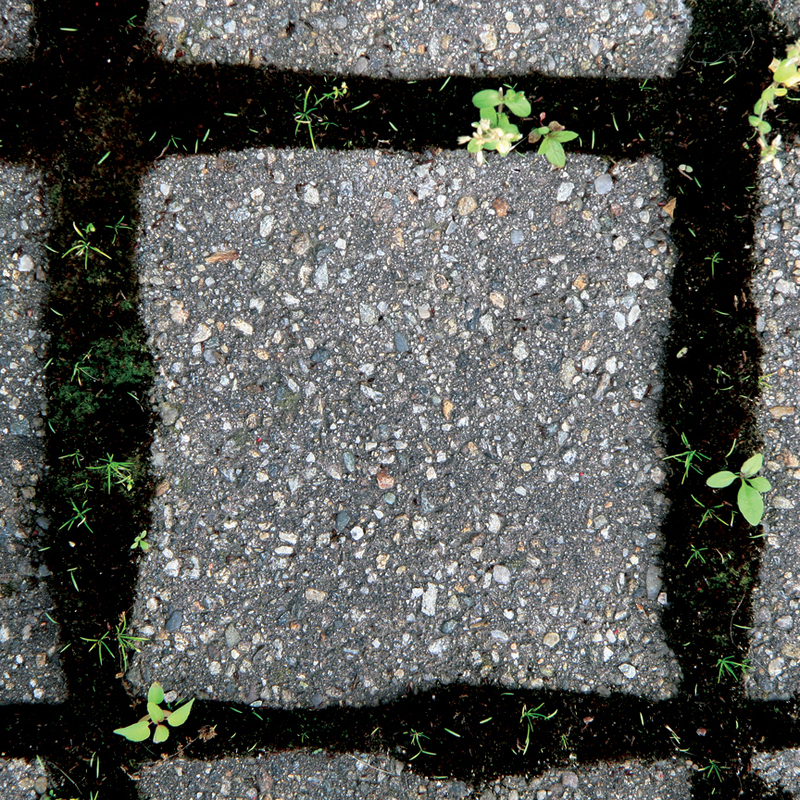 Workers shape the land and artists re-interpret and re-present it in their artwork. 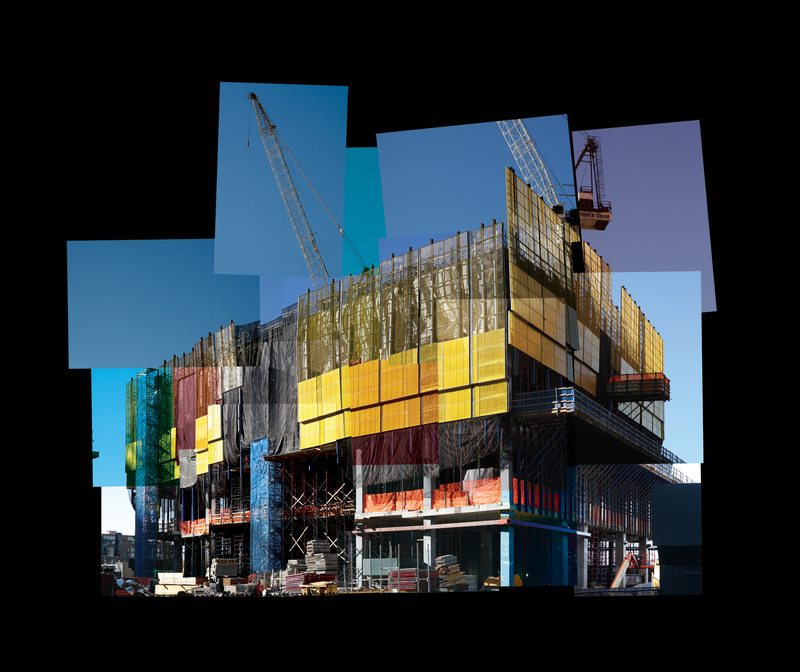 A photomontage of a construction site in Boston, MA. 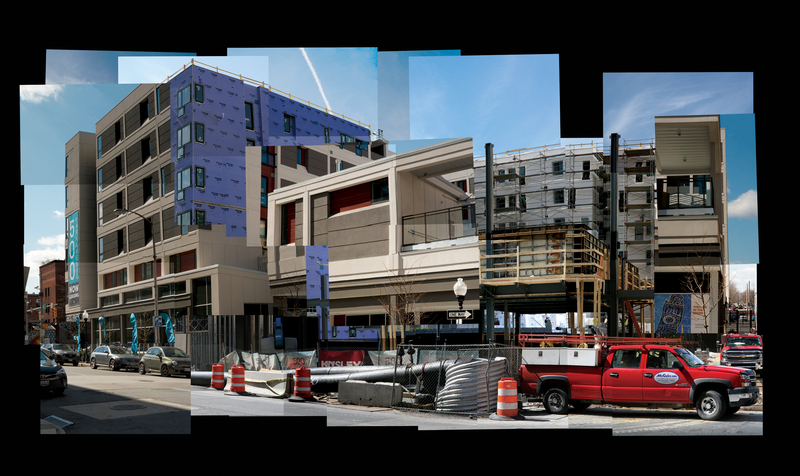 A photomontage of a construction site in Cambridge, MA. 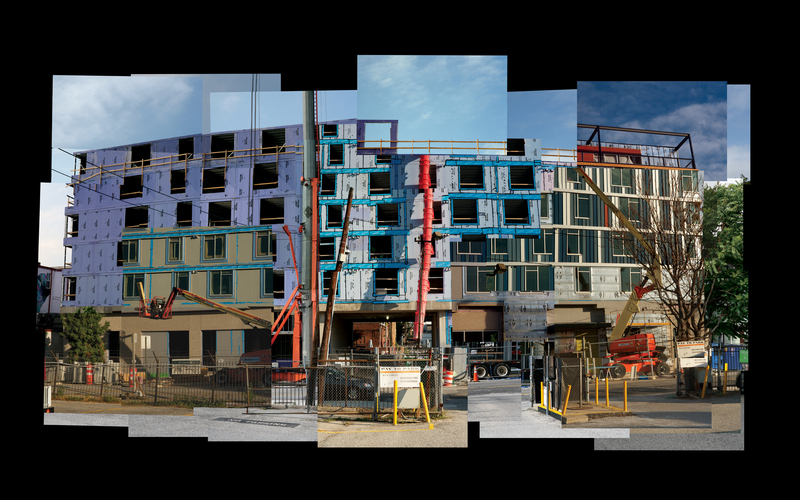 A photomontage of a construction site in Baltimore, MD. 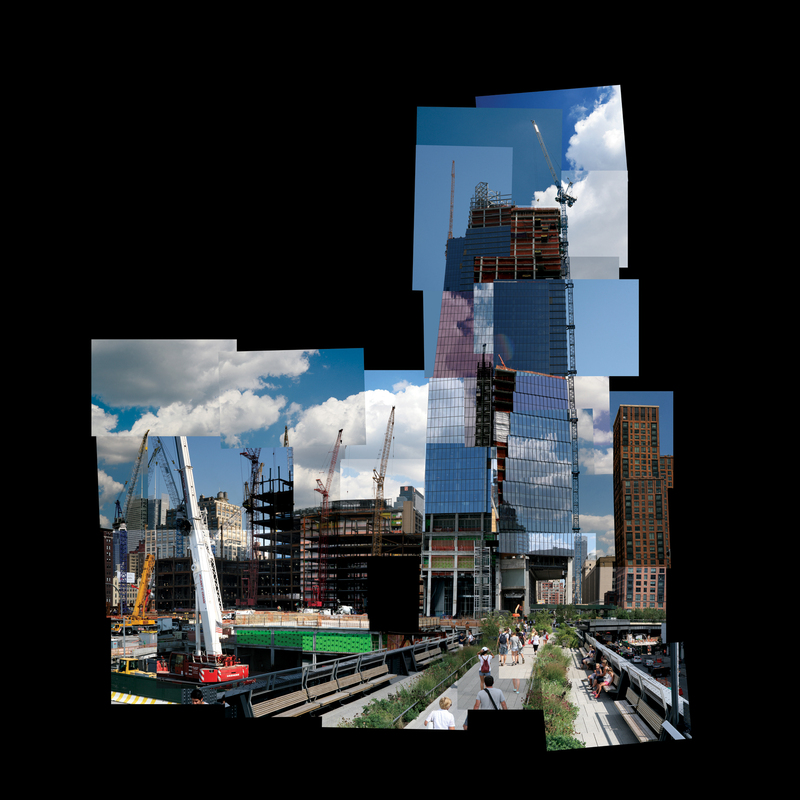 A photomontage of a construction site in New York, NY.